Mike has a Ph.D. is and is a Learning Researcher who focuses on neuroscience and human development. 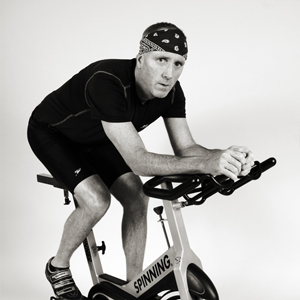 He is a certified Spinning® instructor, a USPTA Tennis Professional and an avid cyclist, runner, swimmer, and golfer. His unique style often brings road rides into the Studio, and his sense of humor keeps his class focused and entertained at the same time. Electronica-techno-triphop-breakbeat-bigbeat. It has to have a pulse that matches foot cadence. The goal of training is to remove the need for a trainer. This is done over time by transitioning from extrinsic to intrinsic motivation — working out because we can — not because we have to. If someone has to scream at you to motivate you, you are not yet ready to transition from exerciser to athlete. Sublime. Cycling is not complete unless the body is joined by the heart and mind during a ride. This is done by focusing on tempo. Riding is rhythm.